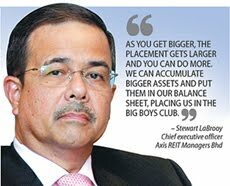 KUALA LUMPUR: Axis REIT Managers Bhd (ARMB), the manager of the world’s first office/industrial Islamic real estate investment trust (REIT), plans to raise RM132mil next month as part of its capital management process, said chief executive officer/executive director Stewart LaBrooy. Axis REIT Managers Bhd chief executive officer/executive director Stewart LaBrooy at the media briefing yesterday. At the back fr left are chief financial officer Leong Kit May, business development & investor relations senior manager Chan Wai Leo and head of real estate David Aboud. “The funds raised will be used to expand our property portfolio and to reduce our gearing,” he told reporters here yesterday at a media briefing in conjunction with its unaudited half yearly results announcement. LaBrooy said ARMB was looking to acquire two new logistics houses and a retail warehouse in Johor, as well as an office building in Cyberjaya, which would cost about RM190mil in total to add to the existing 23 assets it currently owned. Axis REIT properties include assets in commercial, office and industrial real estate. “Upon conclusion of the acquisitions, our total assets under management will be RM1.2bil from the current RM900mil,” he said, adding that on average, the group acquired about five assets annually. He also said ARMB planned to have at least US$500mil worth of assets so that it could attract attention from the international market and that the group was pushing hard to reach that level. “Our aim is to acquire good assets in good locations such as in Penang, Klang Valley and Johor Baru that can bring value and benefit to the group and also to the unit holders,” he said. On the group’s financial results, LaBrooy said ARMB was on the right track, with growth seen in revenue and distribution per unit compared to the preceding quarter despite the volatility in global markets. “This year also saw us comprehensively revalued five of our properties - Axis Shah Alam DC, BWM Centre PTP, Giant Hypermarket, Nestle Office & Warehouse and Quattro West - and this resulted in a positive change in fair value of RM9.07mil,” he said. Axis REIT, which owns mostly industrial properties, posted a 74.51% rise in net profit to RM21.87mil for the second quarter ended June 30, compared with the same quarter a year ago. LaBrooy attributed the jump in net profit to a combination of revaluation surplus and realised gains from distributed profit and revaluation gains. Revenue for the quarter under review stood at RM21mil, a rise of just over 21% compared with a year ago. LaBrooy said Axis REIT’s performance in the third quarter would improve due to the satisfactory performance of its existing portfolio and with Quattro West property coming on stream. AXIS REIT Managers Bhd (ARMB) targets to manage some US$500 million (RM1.6 billion) worth of assets and is in the process of buying more properties in the Klang Valley and Johor. ARMB, manager of the Axis Real Estate Investment Trust, an Islamic office and industrial property trust, now manages 23 properties worth a combined RM952 million, ranging from offices and warehouses to logistic centres and hypermarkets. 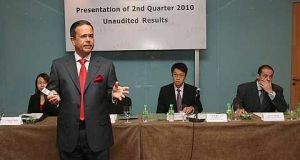 By end-2012, it will manage 27 properties worth a combined RM1.2 billion, ARMB chief executive officer Stewart LaBrooy told a media briefing in Kuala Lumpur yesterday. ARMB is buying a logistics warehouse in Port of Tanjung Pelepas and a Tesco hypermarket in Johor, as well as the Axis Technology Centre in Petaling Jaya, Selangor, and the Axis PDI Centre in Klang, Selangor, totalling RM240 million. LaBrooy said the deals, except for Tesco, will be completed by October this year. ARMB is still in negotiations to buy the hypermarket. He added that ARMB is also in the midst of buying the Axis Techpoint 1 in Petaling Jaya, a logistics warehouse in Johor and an office building in Cyberjaya, through third party transactions. The acquisitions, worth a combined RM190 million, will be completed by early next year, he said. LaBrooy also said ARMB will place out 68.82 million units next month or about 20 per cent of its current fund size, to raise RM132 million for the acquisitions. "As you get bigger, the placement gets larger and you can do more. We can accumulate bigger assets and put them in our balance sheet, placing us in the big boys club," he said. LaBrooy said ARMB will continue to look for valuable assets in prime areas with long term returns. ARMB's net profit for the quarter to June 30 2010 almost doubled to RM21.9 million due to the higher value of its properties. "It is always our intention to be in the billion ringgit club. We have reached the first step of development, which is to surpass the RM1 billion mark. "What is next is to reach RM2 billion. We will work very hard to get to that level. Anything we buy must have a long term strategy," LaBrooy said. He added that ARMB may dispose of some of its current assets that have fully matured.